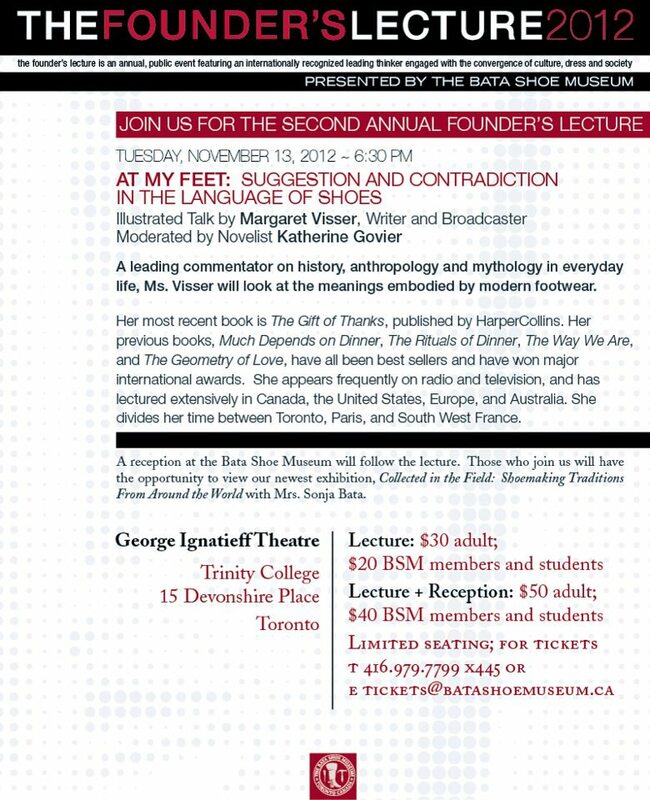 A reception at the Bata Shoe Museum will follow the lecture. Overall, this is a delightful and graceful gift of a book, for which any fortunate recipient will be thankful. Visser is one of a small number of writers able to both use and transcend conventional academic scholarship to offer readers a truly liberal education. "The Gift of Thanks is one of those uncommon books that not only tells you things you always wanted to know and convices you that they are true, but also makes you want to begin to change your life." "Visser, as always, is unique." Nothing orders our lives so smoothly and so subtly as the almost invisible ordinary. The simple habit of saying “thank you,” and the notion of gratitude that underlies it, can be a key to understanding many of the basic assumptions, preferences, and needs of Western culture. Yet most people think surprisingly little about gratitude. Whether her subject is the food on your dinner plate or your table manners, Margaret Visser has been able, in five award-winning works of nonfiction, to uncover and explain the intriguing and unexpected meanings of everyday objects and habits. Now she turns her keen eye to an exploration of another custom so frequently encountered that it often escapes attention: saying “thank you.” What do we really mean by these two simple words? What are the implications of gratitude, and why are we so enraged when we meet its opposite? This fascinating inquiry into all aspects of gratefulness ranges from the unusual determination with which parents teach their children to thank, to the difference between speaking the words and feeling them, to the way different cultures handle the amazingly complex and important matter of giving, receiving, and returning favours and presents. 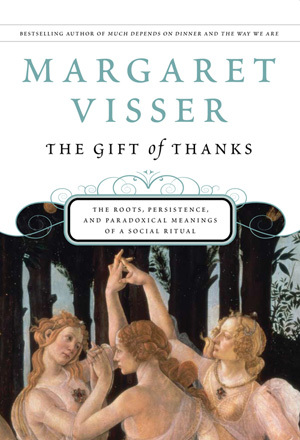 Visser illuminates the fundamental opposition in our own culture between gift-giving and commodity exchange, and the similarities between gratitude and its polar opposite, vengefulness. The Gift of Thanks considers cultural history, including the modern battle of social scientists to pin down the notion of thankfulness and account for it, and the newly awakened scientific interest in the biological and evolutionary roots of emotions. In Margaret Visser’s hands, gratitude becomes a key to understanding many aspects of everyday behaviour. Enlightenment is drawn from folklore, mythology, and fiction, as well as from common customs such as the wrapping of gifts, Remembrance Day ceremonies, and the “paying” and receiving of compliments. With her engaging combination of curiosity and erudition, Visser once again reveals the extraordinary in the ordinary. The Gift of Thanks reached number two on the list.